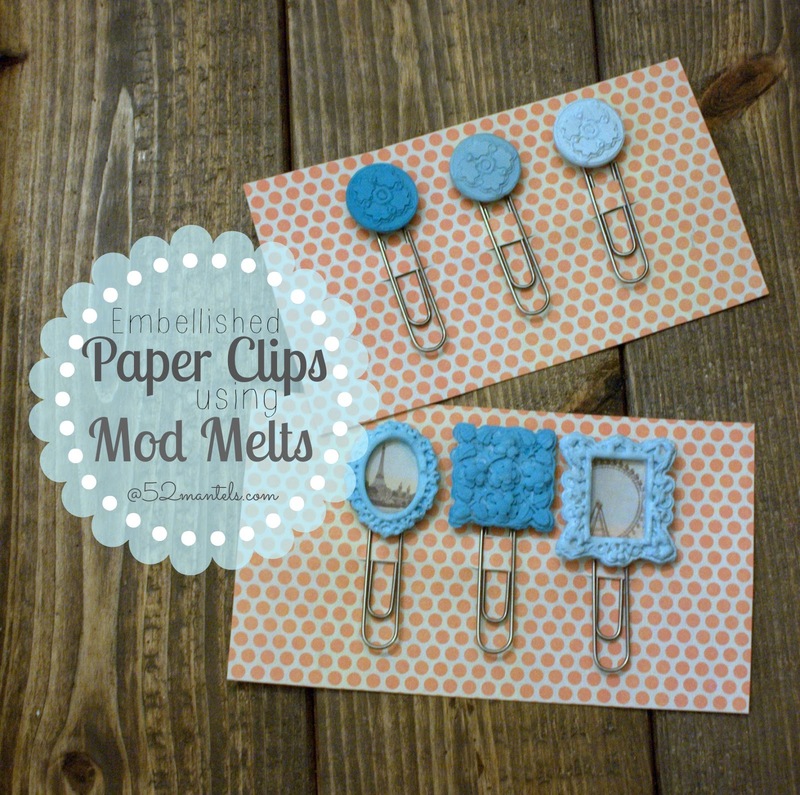 Today I've got a fun tutorial for embellished paper clips, using Mod Melts by Mod Podge! Plaid Crafts sent me a box full of their latest craft products to try out and I was so excited to get my hands on these Mod Melts. 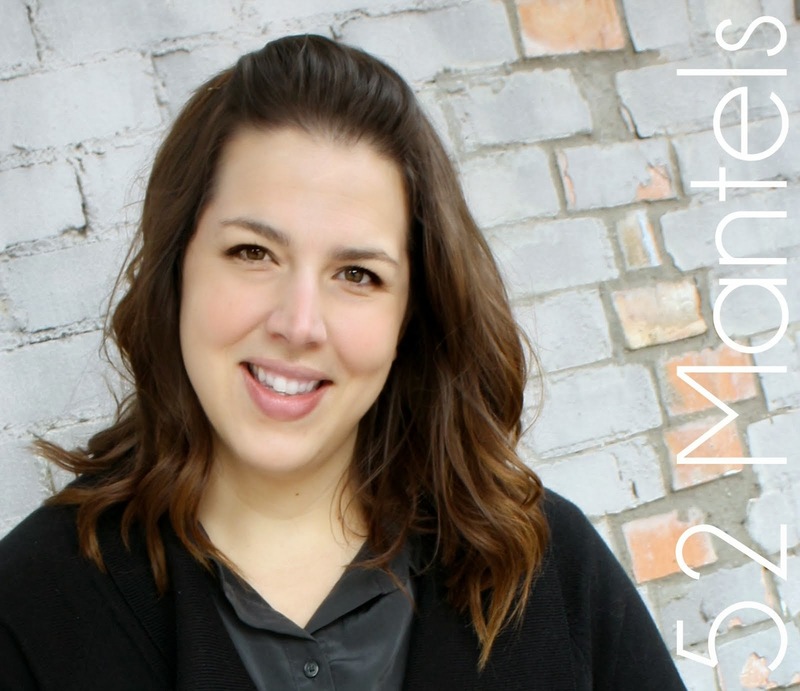 They are easy to use and lend themselves to tons of creativity! I made pretty paper clips (which I think are the perfect handmade gift), but how cute would they be as magnets? Or, push pins?! 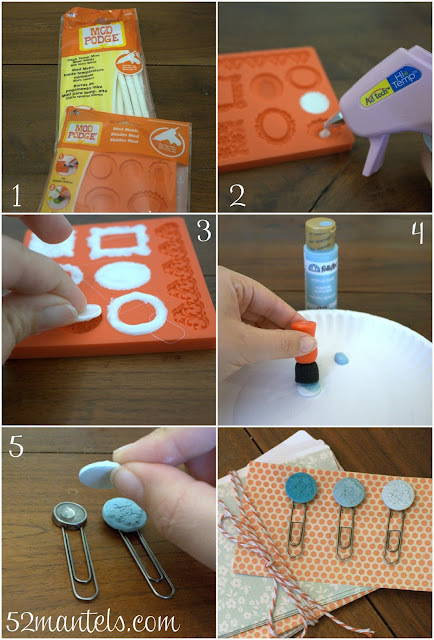 1) Gather your supplies 2) Heat Mod Melt sticks in a Hi-Temp glue gun and fill in the molds. 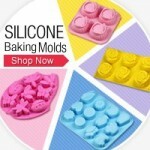 TIP: Use a gentle hand when squeezing the hot gun 3) Let the molds dry for 10 minutes before peeling them out. 4) Use a sponge brush to paint the molds. I used three shades of blue for an ombre effect. 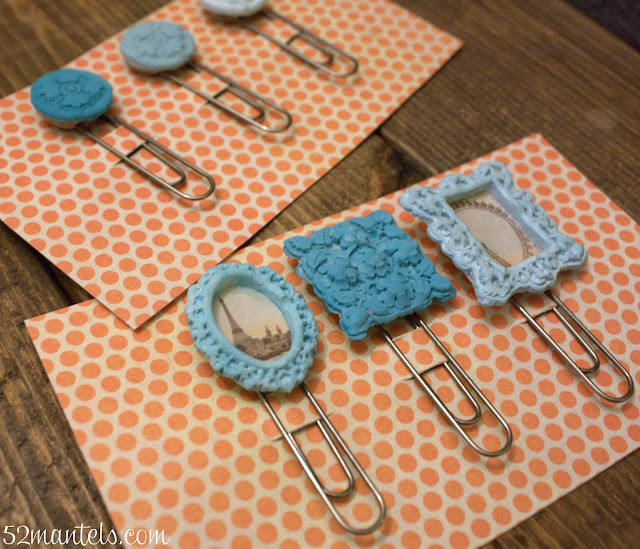 5) When the molds are dry, hot glue them to paper clip blanks (purchased at your local craft store). Wouldn't these be a fun teacher gift? School will be starting soon enough and it's always nice to collect a few handmade gift ideas! I also made another set, using three alternate molds. Don't you love the picture frames? So sweet! To make the (slightly) more complicated paper clips, I started the same way, but then I added Podgeable Papers to the centers. You really ought to check these Mod Melts out! They are so fun to use...and, easy too. And, truly, the sky's the limit when it comes to creative projects you can make with these! **I was compensated by Plaid Crafts to review their products. All opinions are 100% mine. So cute! We love what you made!! These are great! 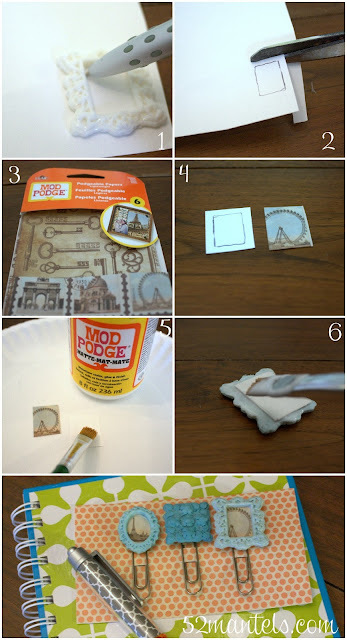 I didn't know there were so many Mod Podge products! They hit stores in July! Do you have Michaels in Canada? That's where they'll be! Brilliant. I need to make a set of these and magnets to pop into my daughters new desk. She'd absolutely love them. Magnets would be SO cute!! Super cute!! I love them. I hadn't heard of Mod sticks, but I'm sold now. Can't wait to try this! Thanks for the great tutorial!! It's a brand new product-- they'll be available at Michaels in July. Yay! These are great! I wonder if you could just glue them onto plain old paper clips. I was thinking of a couple other uses, making little charms for bracelets, necklaces, whatever else somebody could think of. Guess right now my sr. brain decided to take a moment, thanks alot brain, no other ideas popping up just yet. 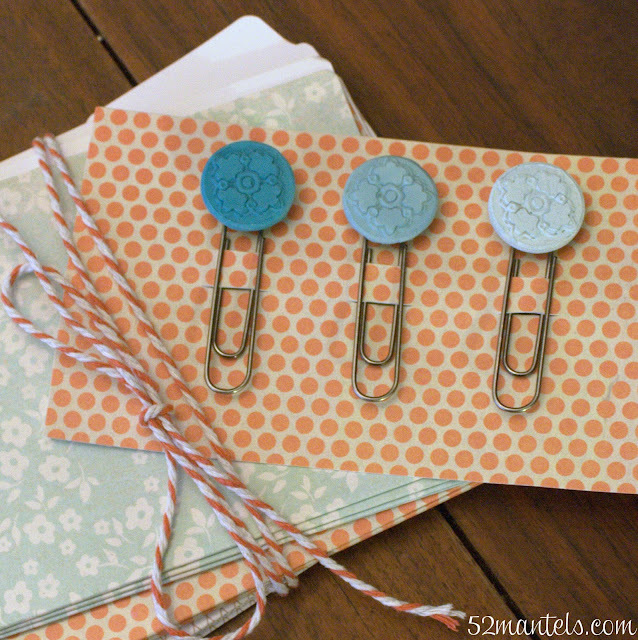 These are so darned cute, love em, sure easy and quick. Boy ModPodge sure is branching out, smart of them. Is all stuff you used in stores now? I'll have to be watching for this stuff. Let's see Michaels, JoAnns or Hobbylobby will have them. Lucky you having them sent right to your door. Those are too cute! Cute for Merr's hair clips too. 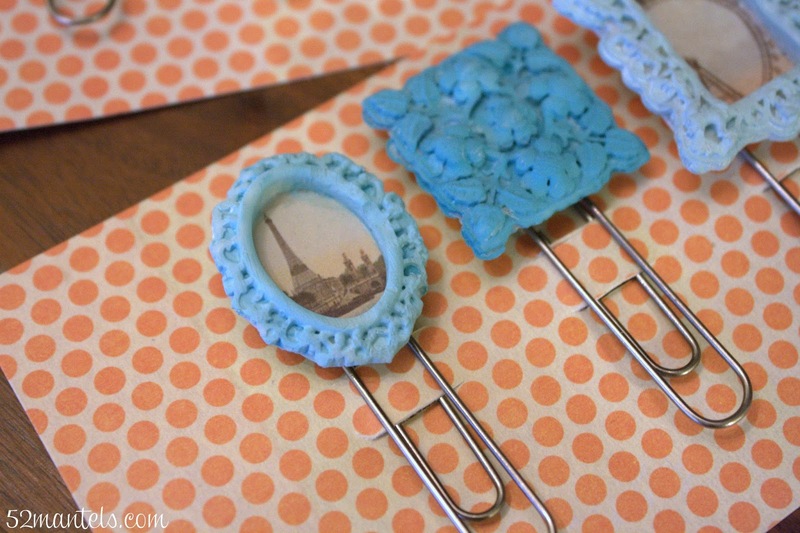 Your paper clips are super cute and I've never heard of Mod Sticks before - thanks! They are so much fun to play with! Super cute, Emily! I love all! Thanks so much for sharing. Hope you have a good rest of week! Thanks Ana-- I'm glad you stopped by! Those paper clips look adorable.. I absolutely love the color - the frames are my fave! Thank you, Amy! It's a fun product! This is so awesome and a really cool idea! Thanks Katie!! I had fun playing around with the Mod Melts!! Emily, these Mod Melts look like fun! Thanks so much for introducing me to this new craft product! Super cool! I love how they turned out!